In the closing chapter of Alfred Sohn-Rethel’s masterpiece, Intellectual and Manual Labor, he invokes the concept of “necessary false consciousness.” This is a type of false consciousness that is not merely faulty consciousness, rather, necessary false consciousness is a type of false consciousness that is logically correct. It is what he calls, “inherently corrigible consciousness.” It is false not against its own standards, but against social existence as such. Its falseness cannot be corrected by logic or conceptual adjustments. It is necessary pragmatically, for the maintenance of the social order. Necessary false consciousness is an adaptation of Marx’s real abstraction and theories of alienation. Of course, Marx’s “for they know not what they do,” which forms the basis of ideology is put to great use by Zizek in the beginning of the Sublime Object of Ideology, but Sohn-Rethel puts it to use without relying upon any theory of the unconscious. Sohn-Rethel is a twentieth century Marxist who defines his position as historical materialist, which means that he is seeking to defend — at a meta-theoretical level — the proper legacy and application of materialism. His critique is waged at the level of epistemology – at correcting Marxist critique, but his work is not pie in the sky postmodern theory. It is very much grounded in an emancipatory idea of worker solidarity but grounded in a critique of epistemology. He should be read today especially as we face such a crisis of theory. His work is based on an effort to think beyond many of the clichés that Marxists had operated under during the twentieth century. For example, he knew very well that the abolition of private capital by the abrogation of its property rights would not automatically dispose of the antithesis of intellectual and manual labor. It is this antithesis that remains in being and makes for the continuation of an antagonistic society. This antithesis must be done away with he argues, but it requires an alteration at the superstructure level – at the level of consciousness. If Sohn-Rethel is to be faulted it is at this level of how to destroy the division between intellectual and manual labor. Just how it might be accomplished, and what its full consequences might be are not well articulated. Largely discredited by most Marxists for his radical theory of commodity abstraction, which we will explore below, Sohn-Rethel’s work is nonetheless fascinating. Like Marx, he claims that all cognitive concepts are derivatives from the material being from which they arise, and because cognitive concepts are derived from this being, and not the being of external nature and the material world, it is the social being of the historical epochs in which these concepts arise and play their part that matter most in terms of analysis. The sophists (if you like) for Sohn-Rethel are the “reflectionists” who view the external world as existing regardless of consciousness. When you ask a reflectionist how a certain idea is a reflection of being he answers by reiterating the same contention in the guise of a prime truth – of a truth that is grounded in an ahistorical intellect. It is this intellect that generates necessary false consciousness and it is this intellect that Sohn-Rethel unearths. What is necessary false consciousness? Its pragmatic nature suggests that it increases at the rate of socialization and normalization. Instead of Marx’s idea of necessary false consciousness only effecting the proletariat, Sohn-Rethel’s is more universal. In fact, we might suggest that there is a direct inverse relation between normalization into social processes and necessary false consciousness. Why? This occurs precisely because, as Sohn-Rethel points out, “the socialized mind of man is money without its attachments and is immaterial, it is pure intellect”. It is here that we discover Sohn-Rethel’s boldest and most original claim, that in the commodity exchange, the basis of abstract thinking emerges, and this is caused by an abstraction that excludes use value. In other words, the action of an exchange of commodities does not banish use from people’s minds. In the act of the currency exchange, because the action is social, the minds of the two people engaged in the act are rendered private. There is always thus a surplus value of capital over labor that makes an inherent parity between equivalence in all exchanges. The exchange itself creates a space of abstraction outside of the social relation. This abstract social relation arises only in the mind. In many ways, it functions as a surplus differential relation as we find in Lacan’s theory of sexual difference, but it is not a theory that relies upon the unconscious. The abstraction of the commodity exchange situates all time and space, and in its act, all observable phenomena are subject to this abstraction (p. 74). Marx’s mystical premonition in Capital that commodities are filled with theological properties and metaphysical subtleties is here radicalized. In the simple act of the handing over of a coin, there is the creation of a new temporality that is abstracted from a quantifiable dimension and this creates the scientific intellect, more of which we will explore below. It was Parmenides’ declaration that being and thought are one which represents the first philosophical proof of the impact of commodity exchange on abstract thinking – on the invention of intellectual labor. For Parmenides, thought is given as what is, and although very different from Parmenides, it is Kant’s transcendental a priori that owes its legacy to commodity abstraction, and indeed it is Kant who is the most dangerous philosopher for Sohn-Rethel because the transcendental subject is just a fetish for the commodity exchange. The commodity exchange enabled the birth of all speculative knowledge in Greek culture. The fact that someone could claim objective valid knowledge based only on an subjective universal basis is a Greek conception. It was the Greeks that first developed a sense of mastery without any sacred Books, only vis a vis nature. Sohn-Rethel’s critique of nature and science picks up on Marx’s reflections in the Economic and Philosophical Manuscripts of 1844, where we find that all history is the process for man to become man, and that nature will subsume itself into the science of man. This is why for Sohn-Rethel, mathematics is the logic of all social thought. Galileo’s inertial motion has the same relation to the commodity exchange, and the fact that Kant was able to develop a priori concepts not grounded upon nature is proof that the commodity exchange has subsumed nature. The formula that guides Sohn-Rethel’s inquiry is that “exact science is knowledge of nature in commodity form” (p. 132). The division of intellectual and manual labor is a crucial part of what makes up the birth of civilization. The rise of private property led to the transition from products to commodities out of the trading between individuals. 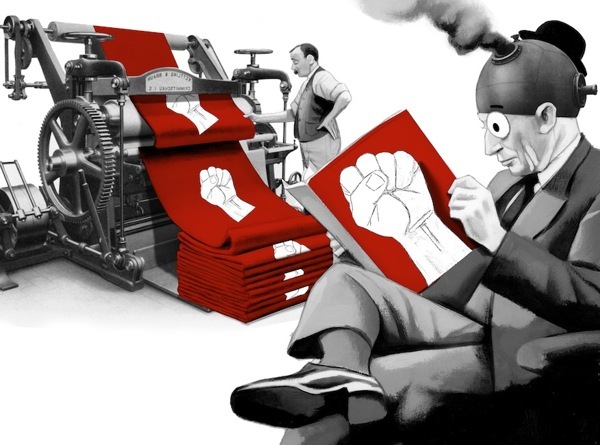 There are two types of societies, societies of production, which are worker generated by labor relations where the social synthesis is geared towards worker solidarity and knowledge, and there are societies of appropriation. Societies of appropriation are societies based on reciprocal exchange of commodities based on private production. “Whatever the type of labor, the social synthesis will determine the consciousness of the era” (p. 86). Breaking the division between intellectual and manual labor is a task leveled at what Marx referred to as the superstructure – it is a task that calls for a change of consciousness. This is the task of the 20th century as Sohn-Rethel sees it, and it is what he sets out in his book to achieve. In his critique of Taylorism, Sohn-Rethel provides some hints towards how to abolish the division between intellectual and manual labor. It was Taylor who took the control of output out of the hands of the machinists and into the hands of management, which led to wide scale automatization and to the necessity of capital over production. As Marx predicted, the separation of intellectual and manual labor results in the power exerted over mans faculties into powers exercised by capital over labor is finally completed by large-scale industry erected on the foundation of machinery (Marx from Capital, 156). “In order for workers not to become divided by their pay packets, the minds of workers should be set in conformity with the compound character of their combined labor” (p. 162). God, this is good. Sohn-Rhethel ought to be the masthead for every radical left-wing organization and publication in the world. Too bad just about no one has ever read him.